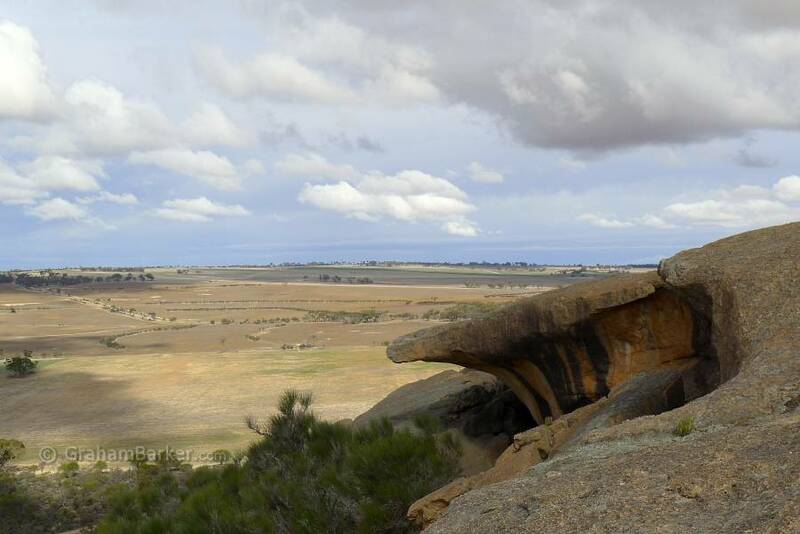 Kokerbin Rock is about 40 km west of the small town of Bruce Rock. Getting there from Perth involves driving east through York and Quairading, then turning left about half way between Quairading and Bruce Rock up a signposted back road. 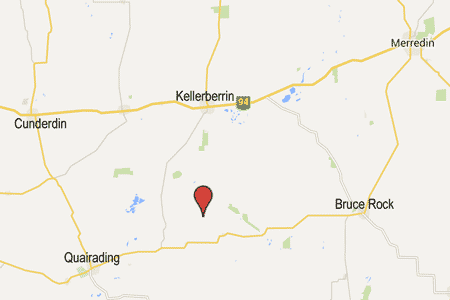 Another approach is to head south from the Great Eastern Hwy at Kellerberrin, as I did. Either way, once you get close to it, it's hard to miss. The picnic area on the south eastern side is a good place to start exploring. Having toilets and space to park makes it handy, but it is also the starting point of the trail which winds its way to the summit. The first feature you pass on the trail is the wave wall, a steep overhang in the side of Kokerbin Rock's base. It poses no threat to the popularity of the famous Wave Rock - it's nowhere near as large or dramatic, and the vegetation restricts the view. But it's the same type of structure, formed in the same way. 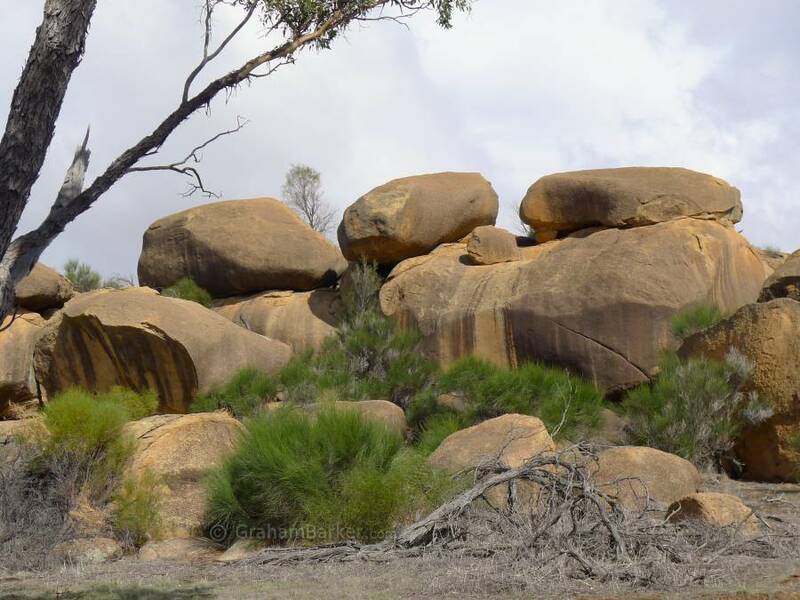 Further on are the Devil's marbles, a collection of rather large and striking boulders which can be attractive in the right light. The vegetation is fairly open, so there is plenty of scope for wandering around. The walk trail meanders to the north western end of the rock, where a short detour leads to a historic old well. It was dug by early explorers back in the 1920s and was vitally important in this area which is dry for much of the year. Now it is just a relic. The well can also be accessed from the gravel road which encircles Kokerbin Rock. Back on the walk trail, the route begins the climb up the surface of the rock itself. It can be a little steep in places - not technically hard, but enough to raise a sweat, and enough to make proper enclosed shoes (not thongs or sandals) a good idea. As sweat and toil are rewarded with altitude, the views over the surrounding countryside increase. As does the effect of any breeze, which can feel very welcome. Climbing up the rock on a sunny day can be hot work, even on cool winter days - taking water and a hat will seldom be regretted! The summit has a stone marker and a place to sit, but the best views are from various spots surrounding it. A heap of massive boulders a short distance below the top can provide a bit of shade, and some nice perspectives of farmland framed by steep rock. The return journey is by the same route, and not surprisingly it feels much quicker going back down. 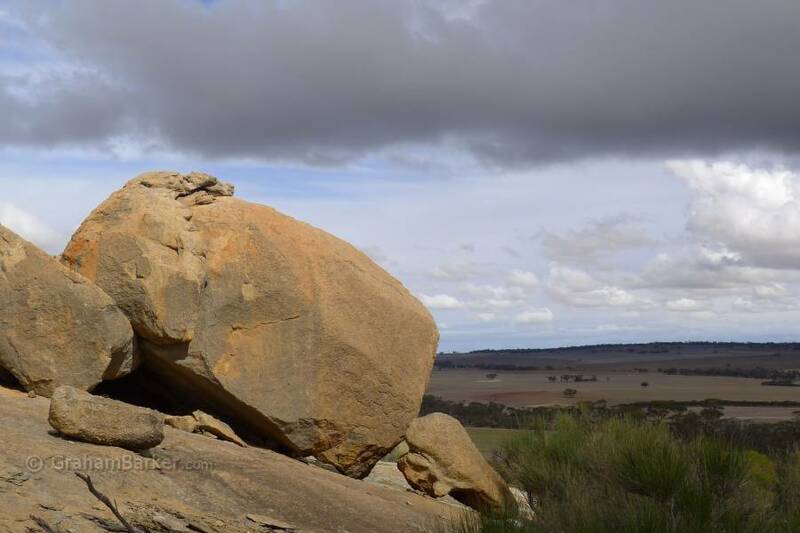 Kokerbin Rock might be considerably smaller and less iconic than Australia's largest monolith, but if you're looking for healthy exercise and striking rocky scenery, it makes for a splendid detour in WA's wheatbelt. 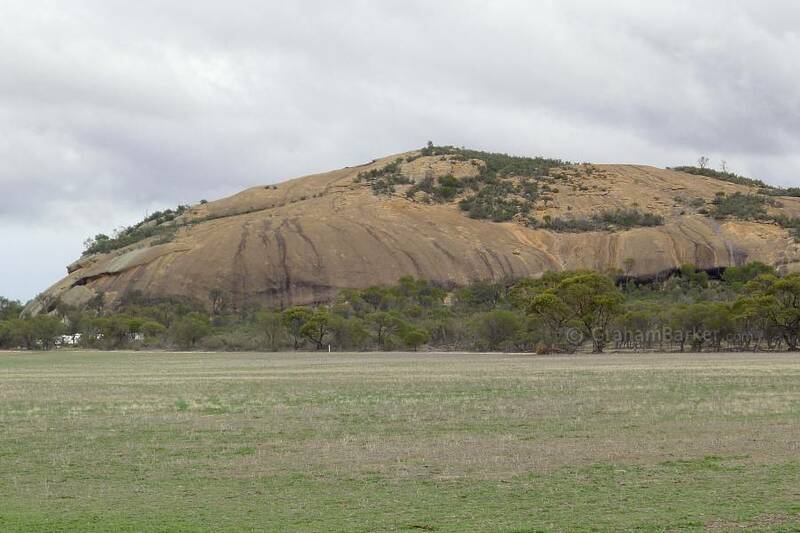 Note - Other than Uluru, I've seen differing rankings of Australia's monoliths and some differing views on which features are monoliths (a single large block of stone standing alone) and which aren't. 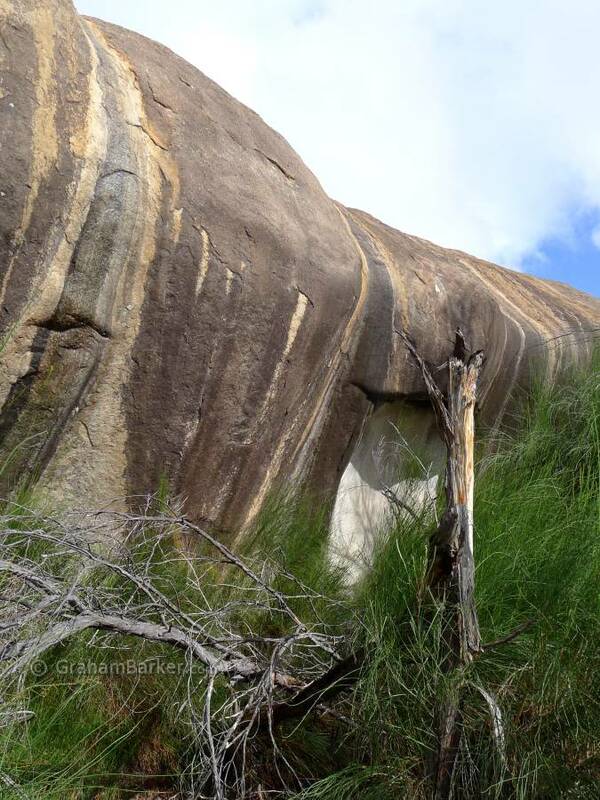 Mt Augustus in WA is the biggest mountain of rock, but is a monocline (a folded layered rock structure) not a monolith. However Kokerbin Rock ranks, it's still a pretty big heap of rock!